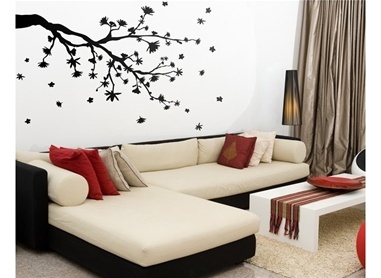 Indiaplaza Blog For smart shoppers |: Spruce up any room decor with wall decals!! Spruce up any room decor with wall decals!! Wall decals and vinyl art are less expensive than textured painting & wall papers, they are fun to decorate with, and easy to apply or remove. So go crazy and be creative when dreaming up your next decal. Make the most of the mystifying space between a headboard and the ceiling with clever room accents. Deck the walls above the bed headboard with square picture frames or wall decals for dramatic visual contrast,or follow the curve of a headboard with a staggered arrangement of decorative wall decals of your choice ranging from floral, nature, animal designs, lettering and many more. Find awesome and uncommon presents for any event at coolgiftusa.